Film noir as a genre developed in America after the second world war, although it had begun during the war. Classic film noir conveyed a sense of dark pessimism, fear, mistrust and general insecurity that was rampant at that time. The use of black and white lighting, a morally ambiguous protagonist, a corrupt authority figure and a femme fatale were common among film noir plots. The endings were rarely optimistic. A sub-genre of film noir is the neo-noir films that came out during the 1960s and after. While neo-noir films largely follow film noir conventions, they are more aware of the role technology plays in contemporary society. The movie Memento is one such example of a neo-noir film. Directed by Christopher Nolan in the year 2000, the plot revolves around a man named Leonard who has lost his short term memory and is searching for his wife’s killer to seek vengeance. He is helped along the way by a corrupt police officer named Teddy and a potential femme fatale named Natalie. The application of neo-noir filming conventions are evident in the film right from the beginning. The opening scene with its camera angle, content and foreshadowing, sets the tone for the rest of the movie. A close-up shot of a polaroid photograph, fading instead of becoming clearer with each shake of the hand, startles the viewer at first. But as the film goes on, the function and importance of the scene is clear. Not only is it evidence of the film as neo-noir, but it is also the only scene in the entire movie that actually runs backwards. As soon as you are introduced to Teddy’s murder, the movie cuts to a black and white scene, strongly grounding itself in the film noir genre. The use of “John” as the name of Leonard’s suspect subtly indicates the pointlessness of his search and gives the impression of a pessimistic ending. As Teddy points out later in the film, there are countless “John G’s” in the world for him to kill. According to Bordwell and Thompson in their book Film Art: An Introduction, “every film coaxes us to connect sequences into a larger whole.” Every film has a structure that makes it possible for the viewer to anticipate certain events. But how can a film, which is after all an object, draw us into such activities? It cannot be the artwork itself. 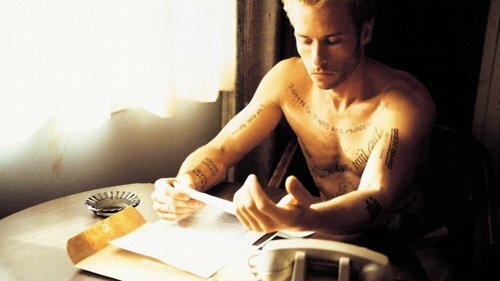 Film Art: An Introduction says that “the artwork cues us to perform a specific activity.” How does the film form in Memento make us complete the plot? The opening sequence cues us to see the murder of Teddy and in the long run, this guides us through the whole movie to look for the reason behind this murder. The use of actual rewinding in the first scene indicates the form of narration that the rest of the film is going to take. cues us to see the rest of the story in fragments that are stringed together in a non-linear fashion. The opening scene thus immediately gives rise to many questions in the viewer’s mind and consequently creates expectations for answers. According to Bordwell and Thompson in Film Art: An Introduction, “what we normally call suspense involves a delay in fulfilling an established expectation.” In Memento, the scenes in the narrative that appear first, appear last in the plot. Therefore, we are constantly expecting answers to questions. How did he get the cut on his cheek? How did she bruise her lip? Who is Leonard talking to on the phone? Why has he taken a photograph of Teddy’s murder? These questions emerge, whether consciously or subconsciously, in the audience’s mind and are answered in the next few frames of the narrative. The bigger questions like why he killed Teddy or what he is town for are answered right at the end, thus creating a deeper sense of suspense and anticipation in the audience. There are also some questions that the audience never asks because it doesn’t suspect that anything is wrong. We never suspect that the car and suit may not belong to Leonard or question the fact that Leonard might have killed the wrong man. These doubts are raised only when the plot unfolds by the end and this brings up the twist ending in the tale. The use of non-linear narration in the film form thus effectively provides surprises, suspense and satisfaction to the audience. Film form evokes feelings and expectations. These feelings and expectations exist partly due to filming conventions and experiences. The elements in the opening scene lead us to the knowledge that it is a film noir and any expectations of an optimistic ending are eliminated. We may also expect a non-linear narrative because we have experienced the director’s previous films that have followed the same trend. The mise-en-scène in Memento is typical of the film noir genre. The use of lighting, colours, costumes, props and the set in general have strong film noir roots. The flashback scenes and the chronological scenes employ black and white lighting. The use of shadows and the contrast of the dark with the light give an objective and rather rational view of Leonard. We see, for the first time, Leonard talking matter-of-factly about his condition and how he overcomes this particular obstacle in his day to day activities. He talks about his days as an insurance claims investigator and particularly about Sammy Jankis who had the same condition Leonard now has and how unlike him, Sammy couldn’t use routine and order to make his life simpler. The lack of colour in these scenes add to the impression that he is not as helpless as Sammy was. We hear him speak of the system he employs to make his life easier, of the organisation and order that he diligently follows. We even see him treat himself like he were a medical case. In these scenes we see Leonard in flashbacks as his former self, before the accident and his memory loss. We are therefore given enough background to empathise with the protagonist. He is not just an empty body with a single, all consuming agenda. The coloured scenes are not as grim as is usual with film noir, but they still employ dull and soft colours. The set lacks any bright colours, as do the costumes. For example, Leonard’s suit is grey and blue and Natalie and Teddy also dress in dull tones. Memento uses many props to further the plot. The most dominant of these props are the polaroid photographs and his tattoos. Leonard uses them as a crutch to survive throughout the film. There are many close-ups of these photographs indicating their importance in Leonard’s life and to the audience’s understanding of the film. Along with his tattoos, the photographs emphasize Leonard’s dependancy on tangible evidence of his life’s actions and goals. It is interesting to see what information he considers more important by where he stores it. It becomes evident that the photographs are dispensable and the information on them can be edited. The scene in which he crosses out what he has written about Natalie and the one in which he tells her she has to burn the photos in order to get rid of them stand testament to the relatively lower importance he gives to certain actions. His tattoos on the other hand are a more permanent documentation of his reality. The set of the movie adds to the grim nature of the film. The lonely motel, abandoned warehouse and the scantily populated town indicate and highlight Leonard’s loneliness. In the scene where he lies in bed with natalie, talking aloud to himself, the camera zooms in on his face, thus underlining the fact that he feels alone and helpless even with someone so physically close him. In general, the camera position switches between the narrative point of view and close-up shots of his face. The camera focuses either on Leonard’s reactions to events or on things that are important to his search for his wife’s killer. There are no shots of the open roads or any scenic images. This gives the feeling that the film is not about the physical surroundings but about which aspects of these surroundings Leonard chooses to give importance to. For example, we see the warehouse and the motel in its entirety. But there are no pan shots of the diner or Natalie’s house since they are places he occupies only temporarily. When he walks up to the diner, the camera moves up to see the name of the place but it instantly moves on to the photograph of Natalie since that is more important. Nolan also heavily employs short takes and flashing images to demonstrate Leonard’s own fleeting memory. Although non-linear narratives are not a recurring theme in film noir or neo-noir genres, Memento uses this device to bring out noir-ish moods and styles. The narrative is divided into two sets. The coloured scenes run in reverse chronological order and are intercut by the black and white scenes that are shown chronologically. The two narratives finally meet at final scene which is the central point of the plot. Many subtle indications of the narrative structure of the film are made throughout. Very early in the film, the motel owner talks to Leonard about his condition and comments on how “it’s all backwards.” The ambiguity provided by the shuffling narrative is used to put the audience in the same shoes as the protagonist. We know only as much as he knows, and much like his photographs and tattoos, every scene is a piece of the puzzle that the audience needs to solve it. Memento uses these various elements of film form, mise-en-scèneand narrative to form a film that is complete in structure and meaning. The protagonist’s mental condition propels the entire story forward. It is because of his inability to retain short term memory that keeps the loss of his wife fresh in his mind each time he wakes up. This aggressive passion makes it possible for him to look actively for her killer. It seems ironic that in order to understand this story of a man with memory loss, we have to depend on our own memory to sift though the evidence presented to us in a non-linear narrative. The film constantly redefine’s the nature of memory, its importance and its accuracy. Leonard’s monologue about the unreliability of memory is a subtle implication of the fact that his own memories before the accident might be incorrect or distorted. Only near the end of the film is the audience forced to consider the legitimacy of the Sammy Jankis story. We are made to doubt the existence of a Sammy Jankis or the story that is allegedly about him and his wife. In the scene where he describes Sammy in a home, helplessly looking around at the doctors, there is a moment when someone walks across the camera, and for that fleeting second, Sammy’s face is replaced by Leonard’s. Could it have been Leonard who lived in a home? We never really know what his earlier life was like based on his personal accounts. The audience, like Leonard, never really knows how long back his wife died. The film, thus, questions the nature of identity as well. What is a person’s identity? Does memory play a big role? If we constantly need to remind ourselves of who we are, what does it say about Leonard who purposely set Teddy up for murder, only to forget about his true intention a few minutes later? Is he to be excused because he doesn’t get the chance to rethink a morally wrong decision? Is he to be excused for accidentally killing his wife only because he couldn’t remember doing it? Is he to be blamed for murdering many men before Teddy based on other people’s manipulation? Throughout the movie Leonard has been used as a hitman of sorts as he is manipulated by Teddy and Natalie. Teddy uses him to kill Natalie’s partner Jimmy while Natalie uses him to seek revenge on Teddy and to get rid of Dodd who is threatening her. As the viewer, we are put in Leonard’s position several times and made to glimpse the magnitude of his misfortune, leading to sympathy and perhaps a bit of empathy. This is shaken for a moment when we realize that in his moment of knowing the whole truth, he chose to ignore it just so he can have another mystery to solve. Before we can resolve this conflict, however, the film ends. Christopher Nolan thus effectively uses noir film conventions to bring out a contemporary style in Memento. It is a movie that comprises of complicated but compact story telling to bring about a coherent plot that makes the audience think as much as watch, truly engaging the mind.